Site under construction. Call Bill Fishbein at 505-690-5834 for information on available products and pricing. Guatemala produces some of the worlds finest coffee, but did you know that it was the Guatemala Maya that first documented the use of Cocoa? CocoMiel, works directly with a bean to bar chocolatier in Guatemala, producing some of the worlds finest quality chocolate. Also within the Ixil coffeelands of Guatemala there has been substantial growth and development in the production of honey. CocoMiel has been working directly with bee farmers for several years and is now importing to the United States raw organic unfiltered honey direct to you. CocoMiel was created by The Coffee Trust to help coffee producers diversify their income and become less dependent on coffee as a sole source of income. 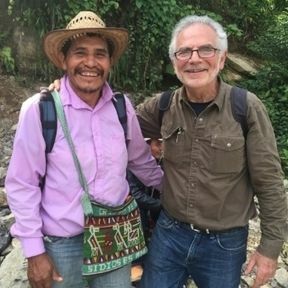 CocoMiel’s mission is to bring producers from the coffeelands of Guatemala into the U.S. marketplace where the producers share equally in the profits earned. CocoMiel’s products include honey, chocolate, coffee, and hand-woven indigenous textiles from Guatemala. All are produced and processed in Guatemala. By processing the products locally, Guatemalan laborers benefit from the income earned. In this way the producing country gains a fairer share of the income generated from products produced, and laborers are more apt to stay at home with their families and their jobs. CocoMiel producers are paid fair trade prices for their products and share CocoMiel profits with The Coffee Trust. I thought Guatemala only produced great coffee, being familiar with Chajulense coffee, I was excited to try the honey and chocolate from CocoMiel. I am so pleased to have discovered how exceptional everything is and love sharing these great Guatemalan products with my customers. Owner Roaster, Trifecta Coffee Co. Albuquerque, NM. CocoMiel is a new venture for Bill Fishbein. Bill has been in the coffee world for over 40 years. In 1977 Bill founded The Coffee Exchange in Providence RI. As the business grew and thrived, Bill came to the realization that he needed to help the farmers and families who produced such an amazing product that contributed to his success. Jumping ahead a decade Bill founded Coffee Kids back in 1988. Since this time Bill's dedication and focus to improve the lives of farmers and their families has been unrelenting. In 2007 Bill founded the Coffee Trust and focused his work and attention in a coffee community called San Gaspar Chajul. This is located in the Ixil region of northern Guatemala where 90% of the population lives in poverty. Bill's philosophy is rooted in helping, educating, and teaching to be self reliant and self sustaining. Bill employs a concept called "campesino a campesino" farmer to farmer. Farmers share agricultural practices and experiences with each other, learning effective practices from other farmers and create new methods through their own ingenuity. CocoMiel was started in 2019. It is a new project for Bill Fishbein. His mission is to provide a US market for Guatemalan products. Where much if not all of the processing of the cocoa, honey, and textiles is done in country. Where jobs and profits are retained with the farmers and workers who add value to processing these amazing Guatemalan products.